It’s hard to believe that the first month of the New Year is coming to a close. Many people use the start of the year as an opportunity to reflect on their lives and personal goals, setting intentions or “resolutions” for the New Year ahead. The hardest thing that I find about setting resolutions is the expectation and pressure that we often put on ourselves in such a limited time frame. But no matter how you look at it, there’s no denying the element of introspection that traditionally takes place during this time of year. What’s working well in my life? Where would it serve me to make some changes? What do I hope to see for myself this year? I often urge my clients to remember that we can ask ourselves these questions at any time during the year. In fact, we should be asking them quite often. Most importantly, we need to allow ourselves space and room to change and modify our goals, constantly re-assessesing along the way. We make decisions every single day. Some of these decisions are small and mundane, and others can be life changing. Some involve adding something new to our lives and saying “yes,” while others involve clearing out, taking away, and saying “no.” Personally, the latter has always been the most difficult for me. There is a natural positive association with the act of saying “yes,” and a negative association with saying “no.” Recently, I have come to see things differently, and am grateful for this new perspective. 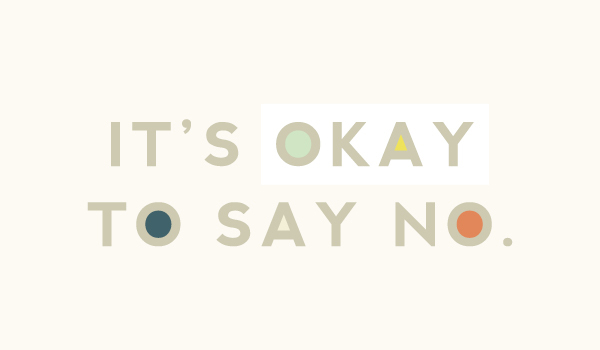 Saying “no” is actually a way of taking care of ourselves. When we get in the habit of saying yes to everything and everyone, we are taking up an incredible amount of space and energy in our minds and bodies, not to mention the actual time in our schedules. If we think about it in a very literal way, the equation will never be fully balanced if we are always adding and never subtracting. If there is something we want to add to our lives, we have to make room for that new career/relationship/routine, and take something out to free up that space…in essence: saying “no.” Maybe it’s saying “no” to watching too much TV or making too many plans, or maybe it’s a bigger “no” that will require some major changes. But either way, it’s a matter of setting priorities, and making yourself one of them. Finally, as a natural part of the re-assessment process, we need to be aware that “mistakes” will be made along the way. If we can give ourselves some room, using a metaphorical “pencil” to write the story of our lives, it will be all the more easier to take chances, try new things, decide that that new thing isn’t working, say “no,” say “yes,” and gently remind ourselves that pencils have erasers for a reason.